The Irish Whale and Dolphin Group officially launched our new marine research vessel, RV Celtic Mist will be used to train and teach IWDG members how to survey and record whales and dolphins, including using acoustic survey techniques. 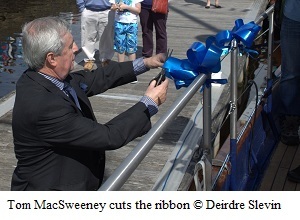 The official launch took place, in beautiful sunshine, on Sunday 12th August at Kilrush Creek Marina, Co Clare and was accompanied by a fun fair, face-painting, music, slideshows and a short student film on the refit. Guided tours of the new vessel were also organised. When I addressed the UK Maritime Foundation’s debate on Sky TV at the Hay Book Festival about the importance of the oceans, I said it was a source of pride to be able to call oneself an islander and that Irish people were entitled to do that because they lived on an island on the periphery of westernmost Europe. I qualified that by pointing out that there were even more true Irish islanders – those on the offshore islands of Ireland – but that, on mainland Ireland and offshore, we shared a common maritime heritage, but a heritage which had been neglected by those who had followed a path which closed their minds and turned their backs to the sea. Regrettably, for the nation’s development, for its economic future, it was those people who had made decisions which damaged the maritime sphere and ignored our ocean wealth. Times are changing, thankfully, but those considerations came to mind when I was invited to re-dedicate Celtic Mist, because as a national journalist in the print and electronic media during the years when he was a leading political figure, I crossed swords with Charles Haughey many times. Before I specialised in maritime matters I was a news reporter, a regional correspondent and a news editor when Charles Haughey was a controversial national political figure. I remember many press and news conferences where disagreements, often bitter, arose between him and the media. I covered several of his general election campaigns when working with RTE. This was the time before the advent of satellite television coverage and mobile telephones. In those days it meant three weeks of criss-crossing the country, through cities, towns and villages, filming his campaign, travelling back to RTE studio headquarters in Dublin for editing and then heading back again to follow the campaign trail. I felt I got to know Charlie pretty well. In later years I differed with him when, after being rescued off Mizen Head by the bravery of Light keepers, he pledged to protect their jobs from automation, but couldn’t and didn’t. However, despite all the controversy about him, the disgrace, the denouement, the revelations, it cannot be denied that Charles Haughey had the interest of the maritime sphere at heart as a seafarer. I have known Dr. Simon Berrow and the Whale and Dolphin Group for very many years. For over 21 years they have done tremendous marine research work. They have always been courteous, kind and helpful to me as a journalist and it has been a good experience to report their work. I felt that I owed it to the IWDG to undertake the re-dedication, even though others might take a different view. 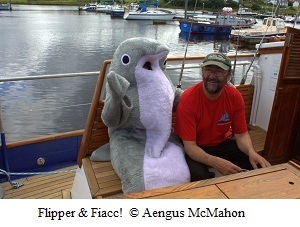 Simon is an impressive television and radio performer and has a touch of the ‘blarney’ when required, which he delivered to good effect when he told that me that I was ‘the maritime voice of the nation.’ After that, how could I refuse? But I did say to Simon that no journalist of my vintage and experience of him could ever ignore the background of the yacht’s former owner, that he was and remained a figure of controversy, a man with whom, like many others, I had “crossed swords” during my career in national newspapers and radio and television. So I travelled to Kilrush and saw the restoration work which had been done with strong voluntary commitment, coupled with local contractor support and financial backing from Clare Local Development Company and other groups. When I went aboard, remembering previous times on the yacht, it recalled memories and, as I told the attendance of several hundred at the re-dedication ceremony on a glorious August day, each Christmas for many years a card arrived at my home from “one seafarer to another”. It came from Charles Haughey, with a message of appreciation for my interest in maritime matters. I looked at Celtic Mist alongside Kilrush Marina, ready for sea again and reflected that, with his m any faults, the huge controversy, disagreement and revulsion expressed in recent years about his career; it could not be denied that in his political life Charles Haughey raised the importance of the maritime sphere in State and Government. That was the focus I brought to the re-dedication ceremony of the gift by the Haughey family of donating the vessel to the Whale and Dolphin Group, under whose operation, it will contribute to the maritime sphere, a role which adds to the wide canvas of this small island nation on the western periphery of Europe, but small only in land size, vast in maritime resources. That is an important role.